High security automatic barriers can also be used as an alternative to swing or sliding gates, where pedestrian access, as well as vehicle access, needs to be controlled. Many of the difficulties associated with swing gates and sliding gates can be overcome by the use of a high security automatic barrier. 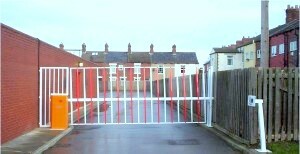 For example, automatic swing gates require a large arc to swing through, while sliding gates need a large area to slide back into, as the boom on a high security barrier lifts upwards, the skirt above and below the boom folds flat, this way no extra space is required, allowing the high security barrier to be installed in the smallest of entrances. High security barrier, with full length skirt. When considering which security product to use you must take into account the speed of swing operation and the speed of the sliding gates. 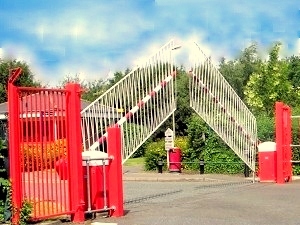 On an un-manned entrance, if an authorised vehicle enters the site it could potentially be well inside the site by the time the gate has fully closed, leaving the site wide open for any opportunist passing, to gain access. With a high security barrier, the vehicle could have entered, and the site perimeter re-secured quickly whilst the vehicle is still in close proximity to the entrance, deterring anyone from entering the site when not authorised. A further advantage of the high security barrier is that it generally has a higher duty cycle than that of a swing or sliding gate, and is more suitable to a busy entrance, being able to provide 1000’s of operations per day. An overworked swing or sliding gate will prove to be less reliable in the long term. High Security barriers are basically upgraded traffic barriers, designed to take a top and bottom skirt. The motor and gear box are heavy duty to allow for the extra weight. The skirt on the high security barrier consists of nylon and aluminium vertical sections, set at 120mm centres, pivoting centrally on a round barrier boom. The bottom aluminium rail of the high security barrier skirt has a linkage which connects the skirt to the barrier pedestal. As the barrier boom raises, the linkage causes the skirt to pivot and fold into the boom so when the boom is vertical the skirt is folded flat against it allowing vehicles to pass through without obstruction. The pivot also acts to lock the skirt into position when in the down position preventing would be intruders to move the skirt aside. Automate Systems supply High Security Barriers with two added security features not normally provided by other high security barrier manufacturers. The first of these consists of the high security barrier cabinet infill. A steel fencing panel, powder coated white and fitted above the cabinet between the top half of the skirt and the wall or fence to the rear of the cabinet. This prevents intruders from climbing over the barrier cabinet to gain entry. The other feature is a frame end support. Unlike a standard fork support, the frame end support prevents the boom from being lifted out of the support and bent into a position that would allow a vehicle through. For added security a magnetic lock can be added to this post. 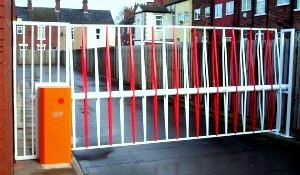 High Security Barriers are ideal for use on sites where both vehicular and pedestrian access needs to be restricted. For example, at police stations or chemical plants. They also provide faster operation than swing or sliding gates. This type of system is compatible with any form of access control card or fob system. The level of security can be further enhanced by installing two high security barriers with a point in the middle to form a holding bay, as is common in many high security MOD sites and prisons. When a vehicle wishes to enter the site, the first barrier is raised to allow the vehicle to be driven into the holding point. The first barrier is then lowered before the second barrier is raised, to allow access onto the site. With this type of system, at no point is the site completely open, and if required, the vehicle and occupants can be checked whilst in the secure holding point between the two barriers. The raising and lowering of the two barriers can either be controlled by security personnel or fully automated through the use of a PLC. 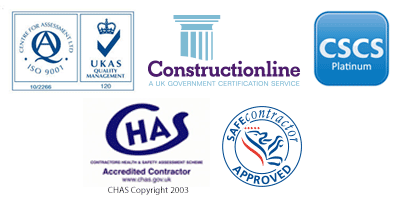 Automate Systems Ltd. take pride in only installing the best automation equipment which is why we are the certified UK distributor for RIB Automation equipment, a manufacturer known for reliability, ease of use and effectiveness. All high security barriers from Automate Systems are fitted, as standard, with heavy duty gear boxes, motors and skirts providing you with the capacity to cope with thousands of operation cycles daily whilst still maintaining fast opening and closing times, designed to increase traffic flow whilst preventing tailgaiting. All of our automatic barriers come with safety devices as standard, consisting of either safety induction loops or safety photocells and in some cases both, as well being fully IP rated, giving you peace of mind that your barrier is fully safe and secure.